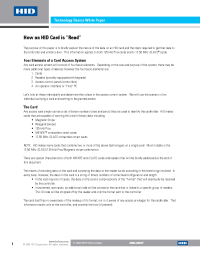 iCLASS SIO-Enabled (iCLASS SE™) smart cards are part of HID Global's next generation secure access control platform and open ecosystem based on Secure Identity Object™ (SIO), a new portable credential methodology, and HID Global's Trusted Identity Platform™ (TIP) architecture for advanced applications, mobility and heightened security. iCLASS SE smart cards feature multiple securely separated application areas that are each protected by 64-bit diversified read/write keys that allow complex applications and provide for future expansion. 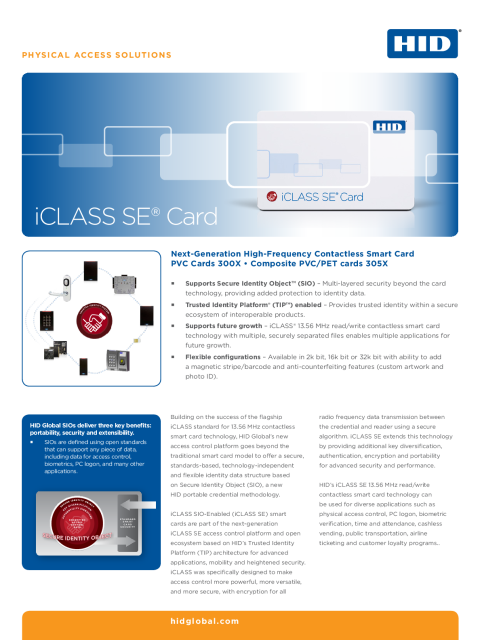 iCLASS SE smart card technology provides secure access control and increases performance with mutual authentication, encrypted data transfer, and 64-bit diversified keys for read/write capabilities. Available in 2k bit, 16k bit or 32k bit with ability to add a magnetic stripe/barcode, the iCLASS smart card meets ISO standard for card size and thickness for use with direct image and thermal transfer printers. The smart card features a graphics quality surface optimized for Photo ID printing, and is available in standard PVC construction or a composite polyester/PVC construction for more demanding high wear and tear environments. iCLASS SE smart cards can be produced with visual security and anti-counterfeiting features such as holograms, ultra-violet fluorescent inks, micro-printing, or a custom logo to quickly and easily identify genuine cards. 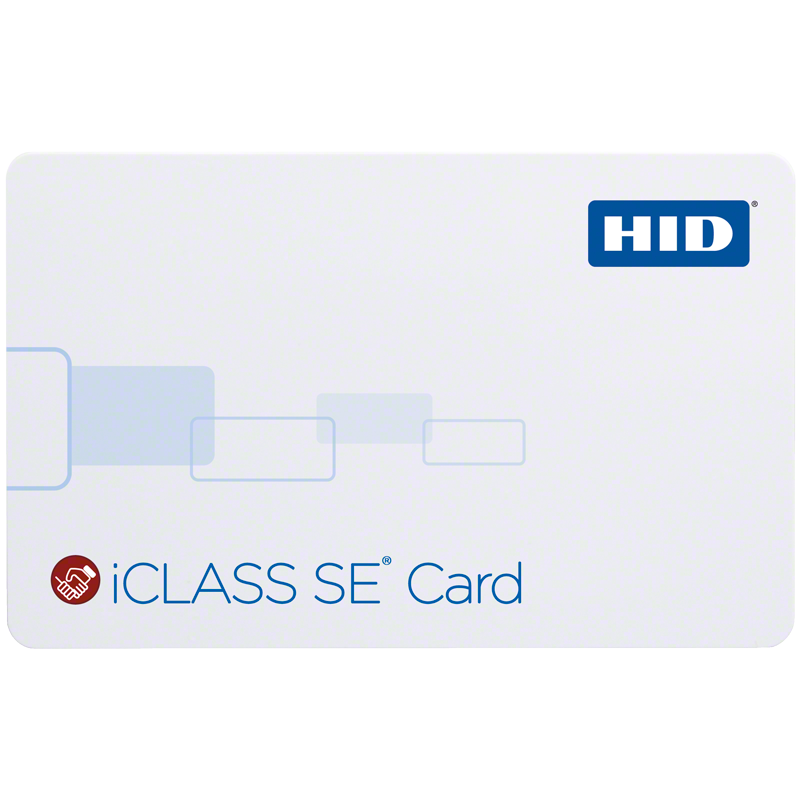 HID's iCLASS SE smart card 13.56 MHz read/write contactless smart card technology can be used for diverse applications such as physical access control, PC logon, biometric authentication , time and attendance, cashless vending, public transportation, airline ticketing and customer loyalty programs. Supports Secure Identity Object™ (SIO) - Multi-layered security beyond the card technology, providing added protection to identity data and secure access control. Trusted Identity Platform™ (TIP) enabled - Provides trusted identity within a secure ecosystem of interoperable products. Graphics quality card surface is optimized for Photo ID printing and are available in standard PVC construction or a composite polyester/PVC construction for high wear and tear environments. Can be produced with visual security and anti-counterfeiting features such as holograms, ultra-violet fluorescent inks, micro-printing, or a custom logo to quickly and easily identify genuine cards.